Prior to this study there was “a dearth of formal understanding on interactions of race with connective tissue diseases in determining cardiovascular risk,” Alenghat said. Previous studies focused on less diverse populations. 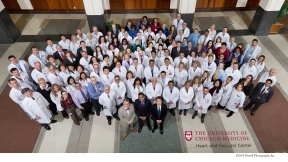 In order to understand these interactions, Alenghat turned to “the large, diverse patient population seen here at the University of Chicago” to provide insights. Alenghat queried de-identified charts from more than 287,000 African-American and Caucasian patients treated at the University’s medical center. He found 10 percent of the African-American patients suffered from atherosclerotic cardiovascular disease—defined as a heart attack, ischemic heart disease, angina, coronary artery disease or atherosclerotic disease of any artery. The prevalence was slightly lower, 8.4 percent, in Caucasians. Alenghat found nearly 30 percent of African-Americans with CTD also had cardiovascular disease, three times more than African-Americans without CTD. White patients with CTD had a much smaller increase. Almost 15 percent of patients had cardiovascular disease, 1.8 times more than white patients without CTD. The National Heart, Lung, and Blood Institute and the University of Chicago’s Center for Research Informatics and the Institute for Translational Medicine funded this study.